Vintage linen knitting crochet notions pouch. It's not hoarding if it's yarn bag. Gifts for fiber artists. Mini thread snips included! Don't you hate having to dig to the bottom of your project bag to find that rogue stitch marker or realizing you left your tape measure in your other bag? Or how about never having your snips handy right when you need them so you have to get up from your cozy crafting chair to go hunt them down? All these annoyances can be things of the past with this handy dandy notions pouch. You can see from the pictures just how much it will hold. I actually have mine stuffed with even more junk but figured you didn't need to see all that! 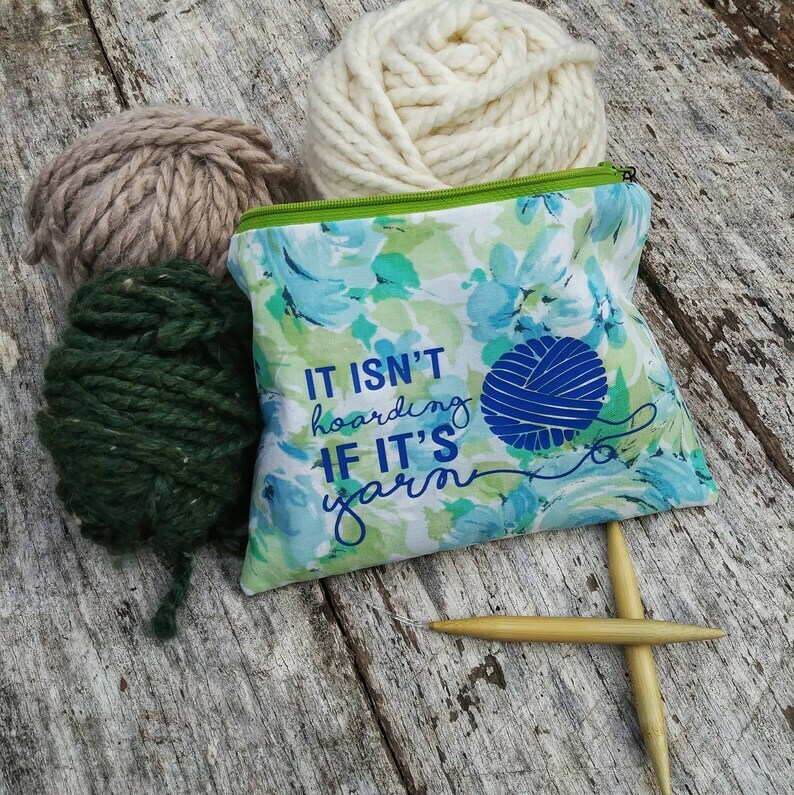 By keeping all your common project notions in this little pouch, you can easily switch it between larger project bags when your attention wanders between multiple projects. But even if you aren't the kind of crafter who has multiple projects in action at the same time, keeping all your small notions in this pouch will save your sanity because you won't have to search your whole bag for itty bitty notions like stitch markers and darning needles. And best of all, this pouch comes with the mini snips that are attached right to the zipper. The snips are a $6 value but I don't think you can put an actual price on the convenience of always having a nice sharp pair of snips close at hand! This pouch is made from a beautiful floral vintage sheet. It's fully lined with the same material inside and lightly interfaced for a little body. The notions shown in the pictures aren't included, aside from the thread snips on the zipper--those *do* come with this pouch. They are just pictured to give you an idea of how much you can stow in this little bag. The pouch measures approximately 5"x7".